Gardening by the moon is an age old practice. Since the moon controls ocean tides, it is believed that it influences the groundwater tables beneath our feet and the movement of fluids in plants. This is why planting at a certain phase and harvesting at a certain phase is supposedly beneficial. These photos I took of the moon by no means do it justice but they remind me just how amazing the moon is. The size of the moon when it first appears on the horizon is enormous. It appears like that because our brains perceive a low moon to be larger than one that’s high in the sky. They actually have a name for this ~Moon Illusion. The moon also can appear warmer or reddish on the horizon. This is caused by moonlight passing through a larger amount of atmospheric particles than when the moon is overhead, this scatters the bluish part of moonlight (which is really white light reflecting from the sun), but it lets in the red parts of the light which travel a straighter path to our eyes. The Harvest moon is actually the full moon closest to the fall equinox. It usually occurs in late September or early October. It was called that because it’s brightness made it possible for farmers to harvest after dark. Here are a few of the blooms happening today in my garden. Have I mentioned that’s my favorite color? Amaryllis are the easiest of flowering bulbs to bloom. It’s botanical name is Hippastrume and it is now a popular Christmas time flower that originated in South American tropical regions. They are not winter hardy bulbs but they are fun to force in the wintertime to have holiday blooms. They always seem like a Christmas flower to me. It’s the red ones that I love. 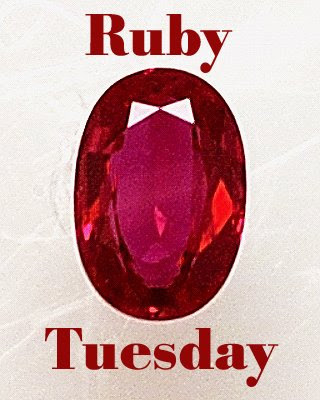 Visit Work of the Poet blog to see other Ruby Tuesday posts. Happy Holidays! Happy Saturday! I swear this pretty feline is posing for me. I hope you have a wonderful weekend. Thanks for stopping by. and it won’t let me play in my garden. 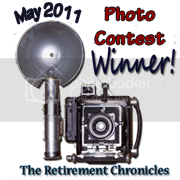 Visit Lisa’s Chaos to see some great macro photos! I am planting bulbs to prepare for the flower fix I will need by January. So to enjoy some springtime in the winter, forcing bulbs can be a lot of fun. It is even a great project for kids because it is so simple to do. Pick out some paper white narcissus, they are the easiest because they require no cold period to simulate winter. Just get a pot that is at least three to four inches deep, fill it with dirt or glass marbles or gems. You can plant a few spaced throughout the pot or next to each other if you have enough. The more bulbs the fuller your flowers will look. To use the gems, just set the bulbs down far enough into the stones to support them leaving a few inches below for roots. Next fill the pot with water just to the bottom of the bulbs. A glass container that is clear is a great one to use for this since you can see the bulb, roots and flowers. Try to have the water barely touch the bottom of the bulb to prevent rotting. As soon as roots develop you can keep the water below the bulb. Another way to plant the bulbs is to place the bulbs in potting soil that covers them just to the top so the pointy end of the bulb is sticking out a bit. Either way you plant them, put them in sunshine in a cool room and wait until they are growing. When they start to grow a few inches, then you should move them to a bright location out of direct sunlight. That way they don’t get too tall and fall over. Stake them if need be and step back and enjoy the show. If they are a bit floppy you can tie a ribbon around them to keep them standing together. This is a ni ce touch if it’s a Christmas gift. 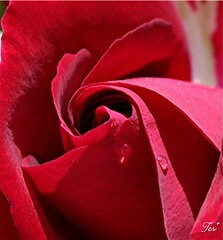 It usually takes anywhere from three to five weeks for flowers.